The DeSantis E32 Econoline Basketweave Duty Belt is a durable, professional option for duty wear at a price that will suit any budget. It is made from a layer of top-quality leather bonded to a hard-wearing synthetic layer. The basket-weave finish adds interest without sacrificing departmental specifications for wear on duty. The belt features a sturdy two-prong metal buckle for secure retention, available ivaired metal options. 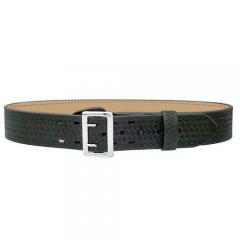 The belt measures 2.25-inches wide and is compatible with a wide range of firearm holsters and belt-mounted accessories.